This article is from the Jan./Feb. 1996 AFRMA Rat & Mouse Tales news-magazine. QI have always heard that if a rat grows up with an exercise wheel they will use it for life, but that it is difficult (if not impossible) to introduce an adult rat to a wheel. What is your experience with this? We are evaluating/redoing the caging for our small companion animals in our shelter and have split opinions regarding wheels. Some people think they are essential and some say they take up the space available to the animal. We would appreciate your opinion on this. QAlso, what is your opinion about the need to include a salt lick for rats and mice? AYes, it is true that if a rat grows up with a wheel, it will use it for its entire life. 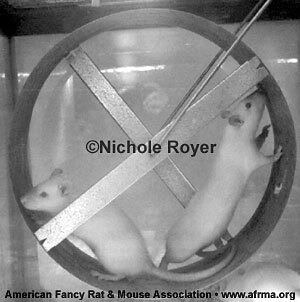 As a general rule, an older rat will not learn to use a wheel; however, I have two females that did. Both were over 5 months old when they were first housed with a wire wheel which they did not use. When I switched to sheet metal wheels (Fern Mfg. ), both became avid wheel runners. These two girls may be the exception rather than the rule (my boys never use the wheel unless they grow up with it). I always tell people who are redoing cages to seriously consider adding wheels, particularly if they have room for an 11 inch one. If the wheel is mounted on the side or the top of the cage far enough above the floor, the rats will have the same amount of usable floor space. Even if they don’t run on the wheel, they will use it for a shelf. I do not know of anyone who uses or would recommend a salt lick for rats and mice. Most people who are concerned about their critters getting enough vitamins and minerals, either supplement their diets with a multivitamin specifically for small animals or with Total cereal. Ed. Note: Rats must have a wheel at least 11 inches in diameter. If you start out with a smaller one when they are babies, they generally stop using it because it becomes too small for them. Females should always have access to a proper-sized wheel. Most males will use a wheel when young, then become too lazy or too big to run in most wheels. Salt licks are not required for rats and mice like they are for rabbits.